A new plan to reduce the number of forestry workers being injured or killed has been launched by the Department of Labour. Of the five sectors where the most harm is occurring – construction, agriculture, forestry, manufacturing and fishing – forestry has the highest rate of workplace deaths. In the past five years 24 forestry workers have been killed – the Forestry Sector Action Plan sets out a plan to reduce this toll. Its part of the National Action Agenda which focuses on driving down the rate of workplace deaths and injuries in the five sectors where the most harm is occurring. “Too many people are being injured or killed on forestry sites around the country – and we know 55% of deaths between 1988 and 2005 related to tree felling and breaking out,” says the Department’s Deputy Chief Executive Lesley Haines. 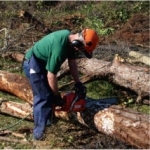 “This is why this Action Plan focuses on growing safety leadership and relationships in the sector, increasing the availability and uptake of training and establishing clear safety standards for tree felling and breaking out. “Our forestry workers all have a right to go home safe from work – and we must all do our best to ensure safety is a number one priority,” Ms Haines says. The Action Plan has been developed by the Department, in partnership with ACC and the New Zealand Forest Owners Association’s Health and Safety Training Committee. It is also closely aligned to the Forest Owners Association’s Strategic Safety Plan and is a way to engage, involve and focus key stakeholders on specific forestry issues. As part of the launch stakeholders signed the Partners in Action Pledge – a symbolic acknowledgement of the collaborative approach needed to workplace health and safety. Since the pledge was launched in May more than 150 organisations, business groups, employers and employees have signed up to do their bit to reduce New Zealand’s work toll.